The Cucurbitaceae genus Trichosanthes comprises 90–100 species that occur from India to Japan and southeast to Australia and Fiji. Most species have large white or pale yellow petals with conspicuously fringed margins, the fringes sometimes several cm long. Pollination is usually by hawkmoths. Previous molecular data for a small number of species suggested that a monophyletic Trichosanthes might include the Asian genera Gymnopetalum (four species, lacking long petal fringes) and Hodgsonia (two species with petals fringed). Here we test these groups’ relationships using a species sampling of c. 60% and 4759 nucleotides of nuclear and plastid DNA. 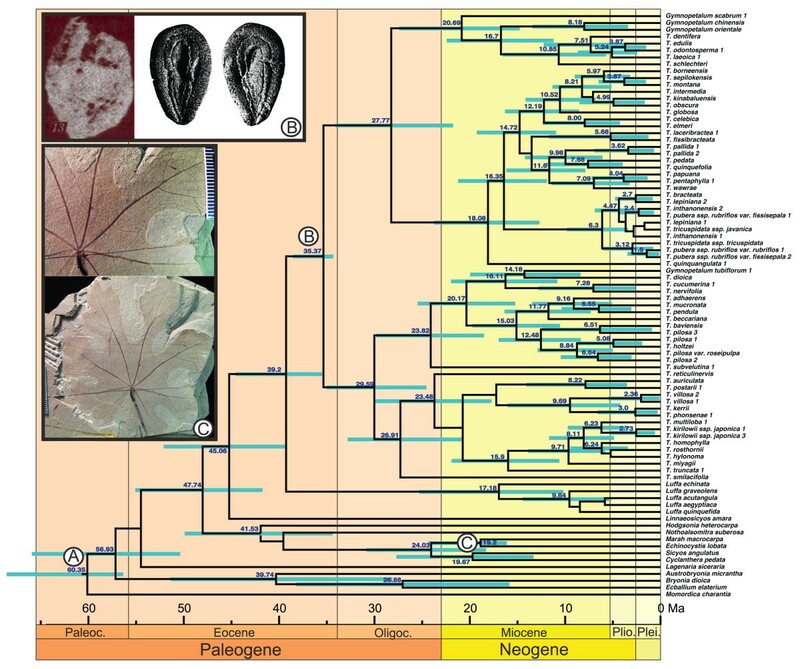 To infer the time and direction of the geographic expansion of the Trichosanthes clade we employ molecular clock dating and statistical biogeographic reconstruction, and we also address the gain or loss of petal fringes. Trichosanthes is monophyletic as long as it includes Gymnopetalum, which itself is polyphyletic. The closest relative of Trichosanthes appears to be the sponge gourds, Luffa, while Hodgsonia is more distantly related. Of six morphology-based sections in Trichosanthes with more than one species, three are supported by the molecular results; two new sections appear warranted. Molecular dating and biogeographic analyses suggest an Oligocene origin of Trichosanthes in Eurasia or East Asia, followed by diversification and spread throughout the Malesian biogeographic region and into the Australian continent. Long-fringed corollas evolved independently in Hodgsonia and Trichosanthes, followed by two losses in the latter coincident with shifts to other pollinators but not with long-distance dispersal events. 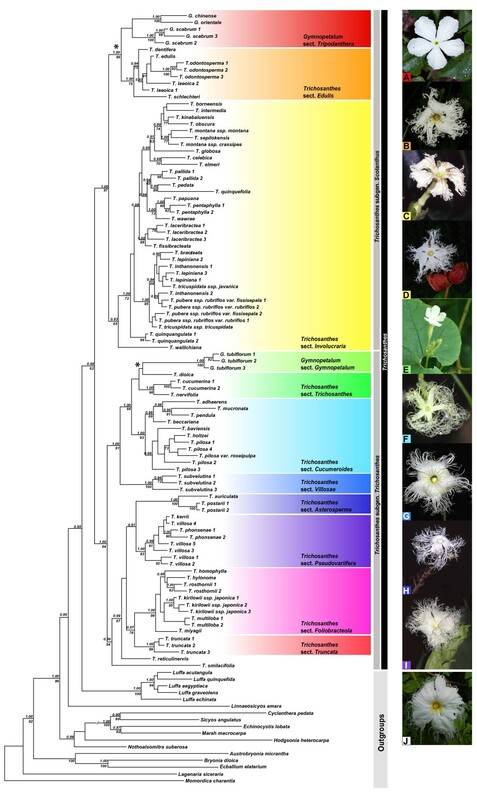 Together with the Caribbean Linnaeosicyos, the Madagascan Ampelosicyos and the tropical African Telfairia, these cucurbit lineages represent an ideal system for more detailed studies of the evolution and function of petal fringes in plant-pollinator mutualisms. Deeply divided or fringed petal lobes are known from a range of angiosperm families, including Caryophyllaceae, Celastraceae, Cucurbitaceae, Myrtaceae, Orchidaceae, Saxifragaceae, and Tropaeolaceae . While the origin and function of subdivided petals vary between groups, division of perianth edges is especially common among nocturnal hawkmoth-pollinated species (such as Trichosanthes, Figure 1), where the fringes, in combination with a light petal color, may enhance visibility and thus increase pollination success [3, 4]. Experiments have shown that diurnal and nocturnal hawkmoths are attracted by floral scent but also rely on visual clues to find and recognize flowers even at extremely low light intensity [5, 6]. A preference for high contrasts might help them find their nectar sources, and it seems plausible that fringed petals enhance the sharp contrast between the petal margin and a dark background . Fully expanded flower of Trichosanthes pilosa Lour. showing the characteristic feather-like fringes along the petal margins. Picture courtesy of Ken Ishikawa. In Cucurbitaceae, long-fringed petals are known in five genera that occur in Madagascar, tropical Africa, the Caribbean, and East and Southeast Asia [7, 8]. The largest of them is Trichosanthes with currently 90–100 species of mainly perennial, 3 to 30 m long climbers that are usually dioecious and have medium-sized fleshy fruits. Referring to the petal fringes, Linnaeus formed the genus name from the Greek words for 'hair' (genitive τριχός) and 'flower' (Άνθoς). Trichosanthes has its center of diversity in Southeast Asia, but ranges from India throughout tropical and subtropical Asia east to Japan, and southeast to New Guinea, Australia, and Fiji . One species, the snake gourd, T. cucumerina L., is a widely cultivated vegetable in tropical and subtropical regions around the globe, and another 15 species are commonly used in Asian traditional medicine . While floristic treatments are available for most of its range [9, 11–16], a comprehensive revision of the nearly 300 names published in Trichosanthes is lacking (but see  for a synopsis). Trichosanthes belongs in the tribe Sicyoeae, a group of 12 genera and c. 270 species that is supported by morphological and molecular data . Based on a limited number of Trichosanthes species sequenced, it appeared that the genus might be paraphyletic, with the genera Gymnopetalum Arn. (four species; ) and Hodgsonia Hook.f. & Thomson (two species; ) possibly nested inside it . Both share with Trichosanthes the white flowers, elongated receptacle-tubes, and free filaments. Hodgsonia also has long-fringed petals (Figure 2J), but differs from Trichosanthes and Gymnopetalum in its much larger fruits (up to 25 cm across) and unusual seeds. The petal margins in Gymnopetalum are entire (Figure 2A, 2E) or in one species shortly fimbriate . Geographically, Gymnopetalum and Hodgsonia largely overlap with the distribution area of Trichosanthes except for their absence from New Guinea and Australia, and from much of the northeastern range of Trichosanthes (temperate China, Taiwan, Japan) . Bayesian consensus tree with posterior probabilities (>0.80) and maximum likelihood bootstrap values (>60%) shown at the nodes. Photos on the right illustrate the floral morphology of the different sections and belong to the following species: A) Gymnopetalum chinense ; B) Trichosanthes odontosperma ; C) Trichosanthes montana ssp. crassipes ; D) Trichosanthes pubera ssp. rubriflos ; E) Gymnopetalum tubiflorum ; F) Trichosanthes beccariana ; G) Trichosanthes subvelutina ; H) Trichosanthes postarii ; I) Trichosanthes villosa . Pictures courtesy of W. J. de Wilde and B. Duyfjes (A, C, D, F, H, I), W. E. Cooper (B), N. Filipowicz (E), H. Nicholson (G), and P. Brownless (J). Inferred losses of petal fringes are marked by an asterisk. Based on mainly fruit and seed characters, the 43 species of Trichosanthes occurring in the Flora Malesiana region have been grouped into six sections, the typical sect. Trichosanthes and sections Cucumeroides (Gaertn.) Kitam., Edulis Rugayah, Foliobracteola C.Y.Cheng & Yueh, Involucraria (Ser.) Wight, and Asterosperma W.J.de Wilde & Duyfjes [21, 22]. The mainland Asian species, T. truncata C.B.Clarke, is in its own section, Truncata C.Y.Cheng & C.H.Yueh . The four species of Gymnopetalum have been allocated to two sections that differ in flower morphology, the typical sect. Gymnopetalum with just one species from southern India and Sri Lanka and sect. Tripodanthera (M.Roem.) Cogn. with three southeast Asian and Malesian species . Here we test the monophyly and phylogenetic placement of Trichosanthes using a broad sampling of some 60% of its species, including the type species of each section name, plus representatives of Gymnopetalum, Hodgsonia, and other Sicyoeae as well as more distant outgroups. The well-resolved phylogeny, combined with field observations on flower shape and color, allows us to test whether petal fringes in Old World Sicyoeae evolved just once as would be the case if Gymnopetalum and Hodgsonia were nested inside it  or multiple times as would be implied by these genera having separate evolutionary histories. A combination of molecular-dating and ancestral area reconstruction permits reconstructing the biogeographical history of the Trichosanthes clade. Phylogenies obtained under Bayesian or Maximum Likelihood (ML) optimization revealed no statistically supported incongruences, defined as nodes with Bayesian posterior probabilities (PP) >0.95 or ML bootstrap support >75. A Bayesian consensus tree is shown in Figure 2. It reveals that the genus Trichosanthes is paraphyletic because Gymnopetalum is embedded in it, while Gymnopetalum is polyphyletic because its four species do not group together. Instead, G. tubiflorum (Wight & Arn.) Cogn. groups with species from sections Trichosanthes and Cucumeroides (1.00 PP/84 ML support), while G. orientale W.J.de Wilde & Duyfjes, G. chinense (Lour.) Merr., and G. scabrum (Lour.) W.J.de Wilde & Duyfjes are sister to section Edulis (1.00 PP/86 ML). The Trichosanthes/Gymnopetalum clade (56 species sampled; 0.99 PP/62 ML support) is sister to Luffa, a genus of seven or eight species of which we included five. This sister group relationship, however, is only weakly supported (Figure 2). The genus Hodgsonia (two species with long-fringed flowers, one sampled here) is only distantly related to the Trichosanthes/Gymnopetalum clade. Of the seven sections previously proposed in Trichosanthes (see Background), three are supported by the molecular results, namely sections Asterosperma (1.00 PP/100 ML; three species, two of them sampled here), Cucumeroides (1.00 PP/93 ML; seven species, five sampled), and Edulis (1.00 PP/75 ML; nine species, five sampled). Three other sections with more than one species (Involucraria, Foliobracteola, Trichosanthes) are not monophyletic in their current circumscriptions. To achieve a more natural classification, a revised infrageneric classification has been proposed including two new sections . Based on a fossil-calibrated Bayesian relaxed molecular clock model, Trichosanthes originated during the Oligocene (Figure 3), an estimate influenced by our prior constraint of the crown node of the Trichosanthes/Gymnopetalum clade to 34 Ma. This constraint is based on Trichosanthes-like seeds from the Upper Eocene of Bulgaria  dating to c. 34 Ma and seeds from the Oligocene of West Siberia  dating to c. 23.8 Ma . Seeds assigned to Trichosanthes have also been reported from Miocene and Pliocene sites in France, Germany, Italy, and Poland [28–30], and Pliocene Trichosanthes-like leaves are known from France . The biogeographic analysis (Figure 4) inferred an East Asian origin of the genus (region C in Figure 4), but this inference is based only on the living species, while the just-discussed fossils indicate a more northern (Eurasian) range of Trichosanthes before the global climate cooling at the end of the Oligocene. Many other extinct elements of the European Oligocene, Miocene, and Pliocene floras, such as Taxodium, Craigia, Fagus kraeuselii, Ilex, and tropical Araceae, such as Caladiosoma, also have nearest living relatives in tropical Southeast Asia [31, 32]. Chronogram for Trichosanthes and outgroups obtained from the same sequence data as used for Figure1, but modeled under a relaxed molecular clock. Node heights represent mean ages and bars the 95% highest posterior density intervals for nodes that have a posterior probability of ≥ 0.95. Fossil constraints used were: (A) Cucurbitaceae seeds from the London Clay (see Material and Methods ), (B) Trichosanthes seeds from Eocene sediments in Bulgaria  and Oligocene sediments in West Siberia , and (C) Miocene leaves assigned to Marah. Inset B shows the Bulgarian seeds (, Figure thirteen) to the left and Middle Pliocene seeds from Poland (, Figures sixteen to seventeen) to the right: Inset C shows the Marah leaf (photos provided by M. Guilliams and D.M. Erwin, University of California, Berkeley). Ancestral range reconstruction for Trichosanthes and outgroups inferred on 8000 output trees resulting from the Bayesian dating analysis and distribution ranges for all species. Letters in the legend correspond to the colored distribution ranges in the map (inset), and letters adjacent to taxon names correspond to the geographic origin of the sampled plant. Wallace’s Line is shown as a broken line between Borneo and Sulawesi, Lydekker’s Line is shown as a broken line between New Guinea and the Moluccas. The three numbered clades and inferred transoceanic disjunctions are discussed in the text. Collision between the Eurasian and Australian tectonic plates started in the Late Oligocene, about 25 Ma ago, and the Sahul Shelf (carrying New Guinea) and Sunda Shelf (Sumatra, Java, and Borneo) reached their present proximity only by the Late Miocene, some 10 Ma [33, 34]. Mid-Miocene pollen records indicate a warm, moist climate and rainforest expansion on these newly forming islands , allowing groups adapted to humid forest conditions, such as the liana clade Trichosanthes, to spread and diversify. Such plant groups would have benefited from land bridges that during times of sea level changes repeatedly connected New Guinea and Australia on the one hand, and Indochina, Sumatra, Java, and Borneo on the other. The lowest sea levels, during the last glacial maximum (LGM), were approximately 120 m below those of today, resulting in the complete exposure of the Sunda Shelf; even sea level reduction by just 40 m already connected Indochina, Sumatra, Java, and Borneo [35, 36]. No land bridges, however, ever connected the islands on the Sunda Shelf with those in “Wallacea,” that is, Sulawesi, the Moluccas, and the Lesser Sunda Islands, or the latter with New Guinea and Australia on the Sahul Shelf. In zoogeography, these two boundaries are known as Wallace’s Line and Lydekker’s line, but their significance as floristic boundaries is doubtful [37, 38]. The most striking transoceanic disjunctions in Trichosanthes are numbered in Figure 4. They are (i) the disjunction between the Australian species T. subvelutina F.Muell. ex Cogn. and its sister clade on the Asian mainland and areas of the Sunda Shelf, dated to 23.8 (29.4-18.4) Ma; (ii) the disjunction between T. edulis Rugayah, T. dentifera Rugayah, T. laeoica C.Y.Cheng & L.Q.Huang, T. schlechteri Harms from New Guinea, and T. odontosperma W.E.Cooper & A.J.Ford from Australia on the one hand, and Gymnopetalum chinense, widespread in Asia as far East as Flores, and G. orientale in Sulawesi, the Lesser Sunda Islands, and the Moluccas on the other (this is dated to 16.7 (22.1-11.2) Ma, but the position of G. scabrum relative to G. chinense and G. orientale remains unclear; compare Figures 2, 3, and 4); and (iii) the disjunction between T. wawrae Cogn. from Thailand, peninsular Malaysia, Sumatra, and Borneo, and its sister clade T. papuana F.M.Bailey/T. pentaphylla F. Muell. ex Benth. from New Guinea and Australia, which dates to 7.1 (11.2-3.3) Ma. Trichosanthes range expansion between New Guinea and Australia occurred during the Pliocene/Pleistocene, when these two regions were repeatedly connected due to the above-mentioned sea level changes . Thus, the estimated divergence time of the Australian species T. odontosperma (a member of clade ii in Figure 4) from its New Guinean sister species, T. edulis, is 3.9 (6.4-1.6) Ma, while that of the sister species pair T. papuana from the Aru Islands and New Guinea, and T. pentaphylla from Australia (clade iii in Figure 4) is 4.0 (7.1-1.4) Ma; considering their error ranges, these ages fall in the Pliocene/Pleistocene. The geographic history of T. pilosa Lour. (including the synonyms T. baviensis Gagnep. and T. holtzei F.Muell. ), a widespread species here represented by seven samples from Queensland (Australia), Thailand, Vietnam, and Japan, cannot be inferred because the within-species relationships lack statistical support (Figure 2). Inferring the origin of the snake gourd, T. cucumerina, a vegetable cultivated in tropical and subtropical regions around the globe (represented by a single sample from Sri Lanka) also would require population-level sampling. Both species have fleshy red fruits and small seeds, probably dispersed by birds. The phylogeny obtained here implies that long-fringed corollas evolved independently in the Asian genera Hodgsonia and Trichosanthes and were lost in three of the four species formerly placed in the genus Gymnopetalum (petals still bear c. 5 mm-long fringes in G. orientale). The two inferred losses (marked with an asterisk in Figure 2) coincide with shifts from nocturnal to diurnal flowering times (HS personal observation of G. scabrum and G. chinense in Cambodia, Jan. 2010, and China, Sept. 2005; N. Filipowicz, Medical University of Gdansk, personal observation of G. tubiflorum in India, Nov. 2010), and it therefore seems likely that there is a shift from predominantly nocturnal sphingid pollinators to diurnal bee or butterfly pollinators. The loss of fringes does not coincide with long-distance dispersal events to insular habitats (where hawkmoths might be absent), and the trigger for the pollinator shifts so far is unknown. The adaptive function of the corolla fringes in pollinator attraction requires experimental study. An innate preference for radial patterns  and high contrasts might help hawkmoths find their nectar sources [5, 6], and one possible explanation for the evolution of fringed petals is that they help create such a radial pattern and sharper contrasts between the petals and a dark background . In a diurnal, hawkmoth-pollinated Viola species, more complex corolla outlines correlate with higher fruit set  but it remains to be tested if this is also the case in the nocturnal Trichosanthes-hawkmoth system. Another untested possibility is that the fringes with their highly increased surface area and exposed position might be involved in scent production (B. Schlumpberger, Herrenhaeuser Gardens, Hannover, pers. comm., Feb. 2012) or produce a waving motion, which has been shown to increase pollinator attraction in other systems . Anatomical studies of the petal tissue of Trichosanthes, wind tunnel experiments with naive hawkmoths, and detailed field observations are required to test these possibilities. Molecular evidence supports the inclusion of Gymnopetalum into a then monophyletic Trichosanthes. Our molecular phylogenies reveal that long-fringed petals evolved independently in Hodgsonia and Trichosanthes/Gymnopetalum, followed by two losses of corolla fringes in the latter clade, most likely associated with pollinator shifts. 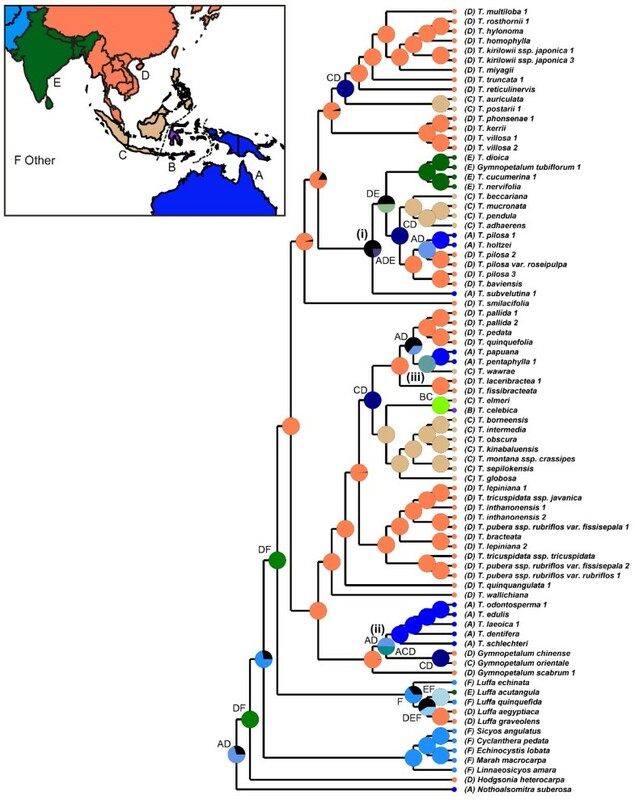 Molecular dating and a biogeographic analysis indicate an Oligocene initial diversification of Trichosanthes in mainland Asia. The lineage then diversified and spread in Malaysia (the Malesian biogeographic region) during the late Miocene and Pliocene, reaching the Australian continent several times. Herbarium specimens from A, BRI, CNS, E, GH, K, KUN, KYO, L, LE, M, MO, P, S, UC, UPS and US were obtained on loan or studied during herbarium visits. Determination of herbarium material was verified using identification keys [9, 11–16, 19, 42]. All species in Trichosanthes have corolla fringes, and these are absent in three of the four Gymnopetalum species, except G. orientale, which can have short-fimbriate petal margins (fringes up to 5 mm length). We included six DNA regions, namely the nuclear ribosomal ITS region (ITS1-5.8S-ITS2), the chloroplast genes rbcL and matK, the trnL and trnL trnF intron and spacer, and rpl20-rps12 spacer. Data for rbcL and the trnL region were taken from previous studies [7, 18, 20, 43, 44]. Only plant samples for which two or more markers were successfully sequenced were included in the analyses, and the combined dataset included one of the two species of Hodgsonia, all four of Gymnopetalum, and 52 of Trichosanthes, representing approximately 60% of the accepted species in the latter genus. Type species of all sections were included: Gymnopetalum tubiflorum (Wight & Arn.) Cogn. (G. sect. Gymnopetalum), Gymnopetalum chinense (Lour.) Merr. (G. sect. Tripodanthera), Trichosanthes postarii W.J.de Wilde & Duyfjes (T. sect. Asterosperma), Trichosanthes pilosa Lour. (T. sect. Cucumeroides), Trichosanthes edulis Rugayah (T. sect. Edulis), Trichosanthes kirilowii Maxim. (T. sect. Foliobracteola), Trichosanthes wallichiana (Ser.) Wight (T. sect. Involucraria), Trichosanthes villosa Blume (T. sect. Pseudovariifera), Trichosanthes cucumerina L. (T. sect. Trichosanthes), Trichosanthes truncata C.B.Clarke (T. sect. Truncata), Trichosanthes subvelutina F.Muell. ex Cogn. (T. sect. Villosae). Species names and their authors, specimen voucher information, and GenBank accession numbers for all sequenced markers (including 262 new sequences) are summarized in Table 1. Gymnopetalum tubiflorum (Wight & Arn.) Cogn. Papua New Guinea, Bougainville Is. Trichosanthes kirilowii Maxim. var. japonica (Miq.) Kitam. Trichosanthes pentaphylla F.Muell. ex Benth. Trichosanthes subvelutina F.Muell. ex Cogn. Total DNA was extracted using the Carlson/Yoon DNA isolation procedure  and a Mini-Beadbeater (BioSpec Products) to pulverize the plant material. Extracts were purified using the GE Illustra GFX™ PCR DNA and Gel Band Purification Kit following the standard protocol. Polymerase chain reaction (PCR) amplification of purified total DNA was performed in 200 μl reaction tubes with a total volume of 50 μl. Each tube contained a mixture of 5 μl reaction buffer (ABgene, 10x), 3 μl MgCl2 (25 mM), 1 μl dNTP’s (10 μM), 0.25 μl Taq-polymerase (ABgene; 5U/μl), 0.25 μl BSA (Roche Diagnostics), 12.5 μl of each primer (2 mM), 14.5 μl Milli-Q water and 1 μl template DNA. The ITS region was amplified using the primer pair ITS-P17 and ITS-26 S-82R  with the following PCR protocol 97°C 5 min., (97°C 30 s., 55°C 1 min., 72°C 1 min.) x 35, 72°C 10 min., 4°C ∞; matK with primers matK-2.1a  and matK-1440R , 95° 5 min., (95° 30 s., 50° 1 min., 72° 1 min.) x 35, 72° 10 min., 4° ∞; and rpl20 rps12 using the primers rpl20 and rps12, 95° 5 min., (95° 30 s., 53° 1 min., 72° 1 min.) x 35, 72° 10 min., 4° ∞. Sequencing was performed by Macrogen Inc. (Seoul, South Korea) on an ABI3730XL automated sequencer (Applied Biosystems). The same primers as used in the PCR were used for the sequencing reactions. Sequence trace files were compiled into contigs with the program Gap4 and edited using Pregap4 , both part of the Staden package . Sequences were aligned manually in Se-Al . The final matrix included rpl20-rps12 (100% of taxa), ITS (96%), matK (84%), trnL-F spacer (31%), trnL intron (28%), and rbcL (20%). The three latter regions increased statistical support values at early-branching clades. Sequences were concatenated, and gap-coded using the Simmons and Ochoterena simple method  implemented in SeqState . Selection of best-fit models of nucleotide substitution for the nuclear and plastid data partitions relied on the Akaike Information Criterion (AIC and AICc) as implemented in JModelTest version 0.1.1 [55, 56]. Likelihood calculations were carried out for 88 substitution models on an ML-optimized tree. The best-fitting model for the combined data was the general time-reversible (GTR) model, with a proportion of invariable sites (I) and rate variation among sites (G) with four rate categories. Maximum likelihood tree searches and bootstrapping of the combined data (using 1000 replicates) relied on RAxML version 7.2.6  on the CIPRES cluster . Bayesian tree searching used MrBayes  on the CIPRES cluster . The combined data were analyzed using three partitions (nuclear, plastid, gap data), allowing partition models to vary by unlinking gamma shapes, transition matrices, and proportions of invariable sites. Markov chain Monte Carlo (MCMC) runs started from independent random trees, were repeated twice, and extended for 10 million generations, with trees sampled every 1000th generation. We used the default priors in MrBayes, namely a flat Dirichlet prior for the relative nucleotide frequencies and rate parameters, a discrete uniform prior for topologies, and an exponential distribution (mean 1.0) for the gamma-shape parameter and branch lengths. Convergence was assessed by checking that the standard deviations of split frequencies were <0.01; that the log probabilities of the data given the parameter values fluctuated within narrow limits; that the convergence diagnostic (the potential scale reduction factor given by MrBayes) approached one; and by examining the plot provided by MrBayes of the generation number versus the log probability of the data. Trees saved prior to convergence were discarded as burn-in (10 000 trees) and a consensus tree was constructed from the remaining trees. The data matrix and trees have been deposited in TreeBASE (http://www.treebase.org; study number 12339). Divergence times were estimated using the Bayesian relaxed clock approach implemented in BEAST version 1.6.2 . Searches used a Yule tree prior, the GTR + G substitution model, and 50 million MCMC generations, sampling every 1000th generation. Six monophyletic groups were defined based on the results of our phylogenetic analyses and previously published phylogenies [18, 20, 44]. Tracer version 1.5  was used to check that effective sampling sizes had all reached >200, suggesting convergence of the chains. TreeAnnotator, part of the BEAST package, was then used to create a maximum clade credibility tree, with the mean divergence ages shown for all nodes with >95% highest posterior density. Calibration relied on Cucurbitaceae fossils assigned to particular nodes (labeled A--C in Figure 3), using a gamma prior distribution with the fossil age as the offset and shape and scale parameter chosen to add a 95% CI of c. 10 Ma older than the fossil. 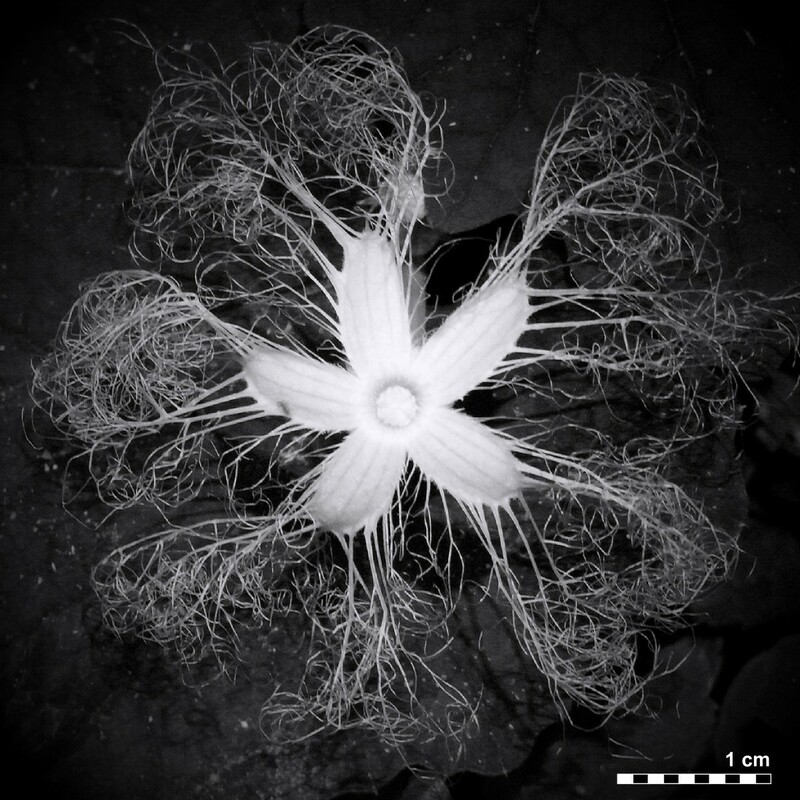 (A) The root node, that is, the most recent common ancestor of Momordica and Trichosanthes, was constrained to 55.8 Ma with a shape parameter of 1.0 and a scale of 1.0, based on seeds from the Paleocene/Eocene Felpham flora representing the oldest Cucurbitaceae and dated to c. 55.8 Ma . (B) The crown node of the Trichosanthes/Gymnopetalum clade was constrained to 34 Ma with a shape parameter of 1.0 and a scale of 3.4, based on Trichosanthes seeds from the Upper Eocene of Bulgaria  dated to c. 34 Ma and seeds from the Oligocene of West Siberia  dated to c. 23.8 Ma . (C) The divergence of Marah and Echinocystis was set to 16 Ma with a shape parameter of 1.0 and a scale of 3.35, based on leaves and a fruit representing Marah from the Miocene of Stewart Valley, Nevada (M. Guilliams and D. M. Erwin, University of California, Berkeley, in preparation; the fruit comes from the Fingerrock Wash site, dated to c. 16 Ma, the leaf from the Savage Canyon Formation, dated to c. 14.5 Ma). Absolute ages were taken from the geologic time scale of Walker and Geissman . We also tested lognormal and exponential prior distributions, which gave very similar age estimates (results not shown). Biogeographic reconstruction relied on statistical dispersal-vicariance analysis using S-DIVA version 2.0  as implemented in RASP, which carries out parsimony inference on the chain of trees obtained from an MCMC search [65, 66], in our case the 8000 post burn-in Bayesian trees resulting from the BEAST dating analysis. S-DIVA averages the frequencies of an ancestral range at a node in ancestral reconstructions over all trees, with alternative ancestral ranges at a node weighted by the frequency of the node . Range information for all species was compiled from taxonomic treatments [9, 11, 13–16], and the coded distribution areas were: A) Australia and New Guinea, B) Wallacea, C) Insular Sunda Malesia, D) Mainland Southeast Asia, E) India and adjacent countries, F) Africa, Europe and the New World. We thank W.J. de Wilde and B. Duyfjes for leaf samples, advice on species sampling and taxonomy, and comments on preliminary results; W.E. Cooper, N. Filipowicz, C. Jeffrey, and I. Telford for leaf samples; L. Nauheimer for Figure 3, B. Schlumpberger and A. Kelber for advice on function of petal fringes, M. Guilliams and D.M. Erwin for information on Marah fossils, and curators of the herbaria A, BRI, CNS, E, GH, K, KUN, KYO, L, LE, M, MO, P, S, UC, UPS and US for samples, loans, or help during visits to their institutions. This research was supported by SIDA-SAREC grant SWE-2005-338, Anna Maria Lundins stipendiefond, Helge Ax:son Johnsons stiftelse, Regnells botaniska resestipendium, SYNTHESYS grant GB-TAF-4255, and Knut och Alice Wallenbergs medel till rektors förfogande. HB conceived the study, carried out the molecular genetic analyses, and drafted the manuscript. HS participated in the design of the study and data analysis, and also contributed field observations. SR and MT participated in the design and coordination of the study, and SR also helped with clock calibration and writing. All authors read and approved the final manuscript.